When it comes to moving our property into a home, for sale, or even for storage, not all of our items will be lightweight and easy to handle; some of them will be heavy and cumbersome. With this in mind, you will have to be more careful when physically moving them from one location to another, as you can cause some severe damage to yourself, specifically your back. Here are some tips to help prevent potential damage that you could cause to yourself from moving these bulky items. Supine Knees to Chest- Lie on your back on a soft yet firm surface (a yoga mat works nicely) with your arms and legs extended. Inhale. As you exhale, pull your knees up to your chest keeping your back on the floor. Stay here a few breaths, then release. Supine Spinal Twist- Lie on your back and bring your arms out to the sides with your palms facing down. Raise your right knee and twist so that it crosses over the left side of your body. Make sure to keep your shoulders on the floor and relax into this position for a few breaths, then release. Cat/Cow Pose- Start on your hands and knees with your hands under your shoulders and your knees under your hips. Your fingertips should be pointing directly in front of you. Inhale as you drop your belly towards the mat, exhale as you draw your stomach into your spine and round your back to the ceiling. Repeat 10 times slowly, then relax. Cobra Stretch- Lie on your stomach, head lifted, with the palms of your hands on the floor and the tops of your feet facing down. Hug your elbows back into your body. Inhale as you begin to straighten your arms to lift the chest off the floor and puff the ribs forward. Try your best to distribute the bend evenly throughout your spine. – Keeping your base wide, shoulder width at the minimum. – Bend, and lift with your legs, not your back. – Keep the object close to your body. – Get help from others, and team lift large or heavy items. 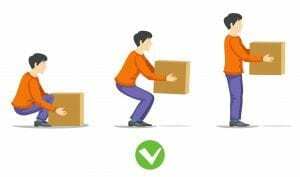 If the object is just too large or heavy to move safely, or you cannot get help with the move, either push the object or utilize a dolly. The Xtra Storage Companies of South Florida have been providing the best value in air-conditioned self-storage spaces for over 30 years. We pride ourselves on every day low prices, no extra fees, and are friendly to our clients! We’re a self-storage company but look at ourselves as an extension of your home. Come by for a cup of coffee and a tour — if you would like to learn more about our rates or the sizes of our units, please give us a call today at (305) 677-1483. We offer small storage spaces that would be perfect for a few boxes if you’d like to clear out some dinnerware etc. !